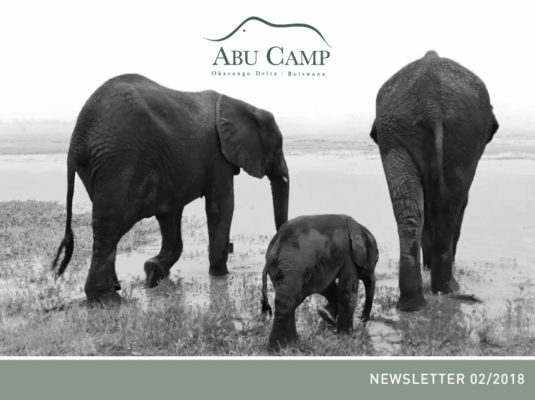 There are many reasons to fall in love with Abu Camp at this time of year… The sting has gone out of the summer sun, and the combination of cooler temperatures and the lush vegetation (which has flourished due to the rains) means that this is a particularly delightful period in which to visit. The ‘green season’ was traditionally seen as a less optimal time to come on safari, but the prevalence of new life, migratory birds, and the chance to see the Okavango in bloom mean that we tend to think of this as the ’emerald season’ – as it’s just as precious as any other. In years with more generous rains, the Delta can take on something of its winter appearance when the annual inundation flows in. This temporary rise in levels foreshadows the miraculous and life-giving waters, and old Okavango hands use it to predict the volume of water to come later in the year. From lovely views to the new love of all our lives… Lorato’s calf, Motlotlo, who has proven just as light-fingered as Naledi when it comes to pilfering. By which we mean, he’s a real heart-stealer. In fact, we’d defy anyone not to fall trunk-over-tail in love with him. His birth at the end of January continues to be a cause for celebration for all members of the Abu Herd, both human and elephant. Under his mother’s loving gaze, his growth and progress have both been rapid and now he is a little grey bundle of activity. Well, perhaps not so little – although we have struggled to persuade him to step onto our special “calfometer” scale, we know that he is now at least 135 kg (300 lb) in weight. This is a great sign that he is growing up healthy and strong. Within a month of his birth, Motlotlo was able to differentiate between his elephant and human companions, and now instinctively raises his trunk to catch the scent of humans. He is busy figuring out who his mother is, and who we are. His personality is also beginning to emerge – although he can be rather shy, he is also very inquisitive and playful (for playful, read naughty). Typical bull elephant that he is, he’s already starting to learn how to use his trunk. Each day, each bush walk with the Abu Herd reveals new wonders for him to explore and he’s revelling in the fact that he has been born into a habitat that’s part adventure playground, part giant salad bowl, and all his to explore. While Motlotlo has inevitably been absorbing a lot of our attention, our recent game drives have given him some serious competition, with sightings of a female cheetah with four cubs (a possible future coalition in its very early stages) and a ten-strong pride of lions that we’ve not previously seen in the Concession. Although leopards may still win out in the predator beauty stakes, they have not had everything their own way of late. There seems to be lots of competition in the Concession when it comes to safeguarding kills. Some of our guests recently watched as a mother and her adult cub joined forces to try and prevent lions stealing their impala kill. On this occasion, guile won out over strength and the smaller cats succeeded in hoisting the carcass aloft into a tree. 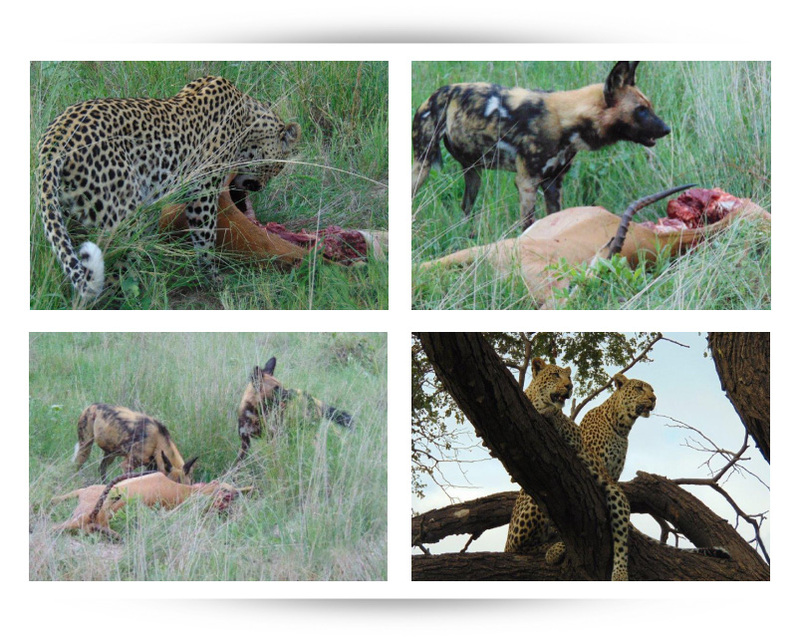 We have also had great sightings of a white-tailed wild dog pack chasing a leopard from a kill. The plot thickened, however, when the Okavango’s arch-opportunists, spotted hyaenas, took advantage of the commotion to make off with the spoils. Who dares wins…. There is perhaps only one species in Botswana that can rival the ability of hyaenas to make the most of any situation. Can you guess which one it is? Here’s a clue – one of them typed this newsletter as soft afternoon rainfall fell, and you’re one too. That’s right: humans! A case in point: during the rains, giant mushrooms (the manifestation of fungi spores) sometimes sprout from termite mounds. They grow with enough force to punch their way through the concrete-hard walls of the mounds, and bloom into white “maboa” the size of dinner plates. These are a delicacy for all kinds of primates, which means that we have to beat the baboons to them. They’re worth an early start, as chopped into chunks and fried lightly in butter and garlic they make the ultimate breakfast of champions. A land of elephant milk and wild honey, where breakfast pops out of the ground almost as you watch – what’s not to love?